All the eligible candidates can download their UPSSSC Marketing Inspector Admit Card 2019 with the help of this page. The direct download link is provided at the bottom of this page. Higher authorities of Uttar Pradesh Subordinate Service Selection Commission had not yet released the exact date for the post of Assistant Chakbandi Officer/ Assistant Rectification Officer, Marketing Inspector, Supply Inspector, Assistant Gardening Officer, Upper District Information Officer (Hindi), Executive Officer (Nagar Panchayat), Revenue Inspector Examination. There are 672 vacancies for the above posts. 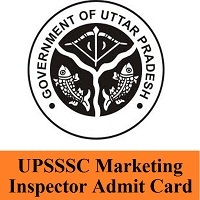 Furthermore, we also provided you with the complete information regarding the UPSSSC Marketing Inspector Call Letter 2019 such as selection process, stepwise process to download the UPSSSC Marketing Inspector Hall Ticket. The examination may be conducted in the month of March 2019. So, plan your schedule according to it. Also, do not forget to download the valid upsssc.gov.in Supply Inspector Hall Ticket which is a mandatory document for the test. After downloading the UPSSSC Marketing Inspector Hall Ticket 2019, candidates are advised to check the details on the hall ticket. If the information present on the admit card are correct then, you are allowed for the exam. If any of the details are wrong, then you can intimate the issue to the officials of UPSSSC. To download the UPSSSC Hall Ticket, candidates should first visit the official website i.e., upsssc.gov.in. Then you will get the home page of the website on the screen. On that home, you can find some segments like applicant segment, notification segment, candidate registration. Search for the UPSSSC Marketing Inspector Hall Ticket 2019. You will get the link to download the hall ticket. Click that link and fill the details asked. After checking the details, click on the submit button. Then, you will get the admit card. Download it and also take hard copies of the UPSSSC Marketing Inspector Admit Card 2019. Soon after the official announcement regarding the descriptive examination date and UPSSSC Marketing Inspector Hall Ticket 2019 release date, we will let you know. You can also visit our website freshersnow.com for other notification.